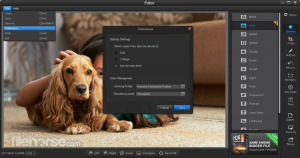 Fotor Photo Editor is tool used for fast editing needs. Fotor photo editing software is easy to use and available for free. Software does not require you to be an editing expert to operate this free photo editor software and it comes with a document on how to use this software. It is straightforward photo editor where one click will does the job for you. You could adjust all the related aspects of a photo. Fotor free download is available online and updates are released regularly. Fotor photo editor is photo editing software free download, which could be downloaded on windows 7 and windows 8.1 for free. Download size of installation file is 58 mb and currently 2.0.2 version is available. Tools in Fotor program are easy to use. Fotor has almost all the tools required for photo editing like brightness, contrast, sharpness, white balance, and many other. In addition, fotor photo editor effects can be added to different photos. fotor is a photo editing software free download Even if you are not satisfied with your editing just click, undo to restore the original version. Sharing to online platforms such as Facebook and twitter is available. You could save image at high resolution in fotor. Even the resolution could be changed depending on your need. Fotor photo editing never takes time in rendering image. You have fast and instant results. As full version is free for editing any kind of photo, it competes well against the popular paid graphic software. Unlike, heavy-duty software fotor photo editor does not take time in rendering the image. You could see a preview of instantly. If you like, it you could save or restore it to its original state. In addition, fotor free download offers 13 1-tap enhance options that are designed to capture different conditions of the photo. It supports wide range of photos such as TIFF, JPEG, PNG, BMP and many more.This free photo editing software is must have software if you like taking pictures.